This time we went to Sedalia, Mo for their annual show in November. It was a fun show and well attended. 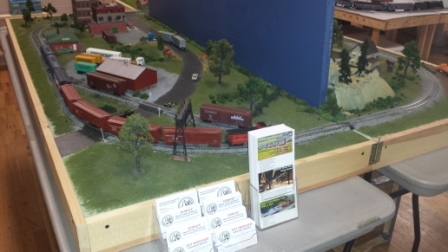 The layout operated well and also got the conversation started with folks about the APRHF. We gave out a good amount of APRHF info. The railroad was set up to be all Missouri Pacific since that railroad was a staple of Sedalia for many years before UP took over. The irony is we had our new to us Amtrak ready to run at this show. But, this engine developed a contact issue and would not run. So no passenger train this day. This engine is being fixed right now. Below are some photos from the show. Here we see things all up and running. The APRHF info on the front side of the layout. You can also see the polar express in the background. 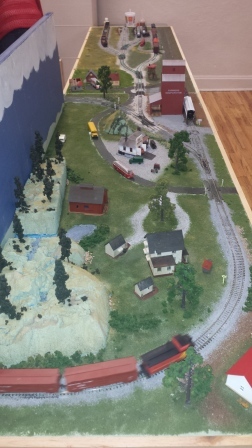 You may notice different buildings on the layout. This layout is finally its own. Meaning that I do not borrow from the home layout anymore. It has its own buildings, rolling stock, engines etc. We are still in need of a DCC system though. Mo-Pac F units from the home collection power this freight train. 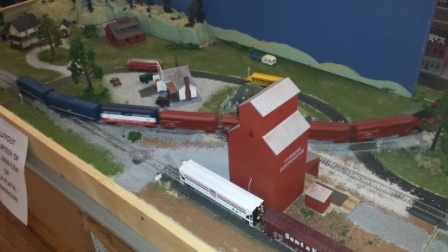 The two grain cars in the forground were replaced at this show. Those were the last two borrowed cars. 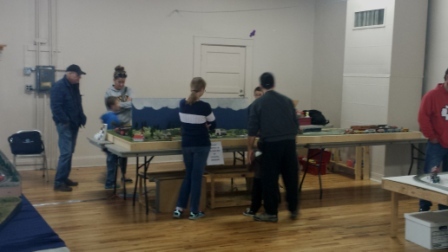 Karri (in the striped sweater), this is the Presidents and Vice Presidents daughter, is in charge now as she talks to the poeple and kids about the layout and trains in general. She is a good operator. The layout will undergo another upgrade this winter. The yard tracks have a couple of tight switches and do cause derailments. They are all being replaced with new broader switches. This will provide for better operations. 1 Comment on "Our “Model Ambassador” is out on the road again"
Good newsletter again. Thanks Bob, Amy, and Karri for putting info abut APRHF out there.